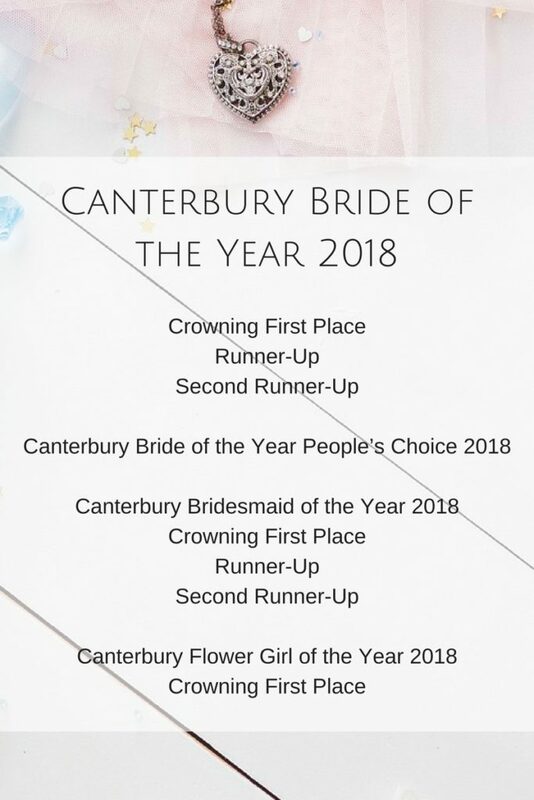 It is with pleasure that we share with you information on the Canterbury Bride of the Year 2018. We encourage those who would love to relive their wedding day memories, showcase their gowns to friends, family and other brides to be to enter. The Canterbury Bride of The Year is a fun relaxed night out with your wedding party/family and friends celebrating the memories of your wedding day. It’s a fantastic opportunity to wear your gown again and relive that special day. You will be in great company and likely share your memories of your special day with others. You will be eligible to win some amazing prizes simply for showcasing your gown. We invite you to bring all of your friends, as well as your family and bridal party. Also, included in the programme is a ‘people choice’ voting opportunity, therefore the more friends and family you have supporting you the more chances of extra votes. The evenings’ programme is a warm and friendly showcase of the current trends in wedding attire, featuring recent brides, bridesmaids and flower girls competing for the 2018 awards and prizes. We foresee your experiences as being a positive and rewarding opportunity for friendship building, fun and personal growth. The rehearsal will provide you with the support and help you gain confidence in your participation, during the show. Complete and submit our online entry form today! Audience spot prizes will be given out and also for newly engaged couples over the course of the evening will delight those who attend. Be sure to watch our Facebook page as we detail prizes over the forthcoming weeks. Complete our online entry form – one per entrant. Attach your photos and make payment for your registration. Each entrant is required to attach one full-length, and one head and shoulders photo in your gown/dress on the wedding day. Payment details are on the registration form. All entrants must complete each section of the official entry form. Each entry must have two photos attached. Entrants are required to attend a rehearsal at ‘The Tannery’ from 5.30pm, Friday 11th May. There will be a further opportunity to run through prior to the event at 5.30pm on Saturday 12th May prior to the commencement of the show. *Please note that photos may be used for promotional purposes. By selecting the circle on the entry form you give the organisers of Canterbury Bride of the Year and their sponsors’ permission to promote you, prior too and following the event. Entry fees must be paid in full, at the time of application. The closing date for entries is Friday, 4th May, or earlier if maximum numbers are reached. Please Note: Entries are limited. Be sure to submit your information as soon as possible, in case it is deemed necessary to close off entries early. The flower girl competition will be held during the first half of the event and flower girls may leave at the interval. The evening is a strictly ticketed event, with a complimentary drink on arrival. A fun relaxing night is planned where guests enjoy everything about wedding attire. Tickets for family members and friends can be purchased through your entry form or at various outlets (follow our Facebook page for outlets). We look forward to receiving your entry and we will provide further correspondence to contestants closer to the time of the event with final guidance regarding the rehearsal and how we will make your experience comfortable and enjoyable.